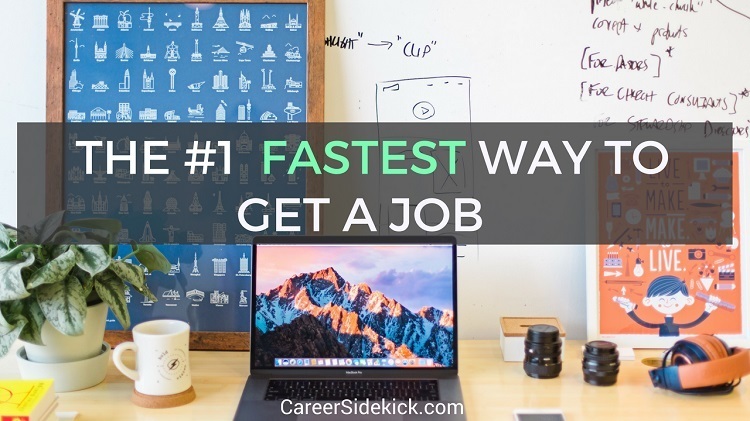 If you’re looking the fastest way to get a job, this article will walk you through everything you need to know. I’m going to show you 3 reasons that networking is the best way to get hired quickly, and how to use proven networking methods to land a great job (even if you have almost NO current network). Don’t worry… I’ll explain how anyone can use networking to get hired, and why it’s so important if you want to get a job quickly and without months of busy-work and stress. First, let’s look at 3 reasons why this is worth your time at the beginning of your job search if you want to get hired faster. Time is the biggest constraint in a typical job search. There’s only one of you. And there are only 24 hours in the day. So the biggest limiting factor in your job search is usually your time and energy. When you use your network and have other people referring you to companies, thinking about who they know in THEIR network that could help you, or thinking about past colleagues they could put you in touch with… you’re eliminating this roadblock. Now multiple people are putting time, effort and thought into getting YOU hired. Fact: Companies and hiring managers trust somebody more when that person is recommended to them by a person they already know and trust. Think about it… if your friend or colleague speaks highly of someone you just met, and says, “this person is great,” you immediately trust them more, right? So if you are recommended or introduced to a company, rather than applying for the job via their website or a job board, it’s the same thing. They’ll be far more likely to interview you. At some point, job searching and interviewing becomes a numbers game. Sure, you could get one interview and one job offer, but it’s not likely. Why? There’s some randomness involved, and not every job is a perfect fit for you anyway (even if you have the best interview skills and preparation). So it is probably going to take a couple job interviews to find the right fit. Sometimes, you’ll even skip a conversation with a recruiter or HR and go immediately to an interview with the hiring manager. That’s the power of being introduced to a company by someone they know. Even if not, it’s likely the company will move you through the interview process faster if the hiring manager knows somebody in their network has recommended you. They’ll be more eager to talk with you. They might even forgive a few mistakes if part of your interview went badly. You still need to impress them to get hired but maybe they’ll forgive one or two mistakes early in the interview if somebody spoke highly of you. Now, if you don’t have a big network or if you just graduated and are looking for your first job after college, you might not have a huge network. That’s okay. I’ll walk you through what to do. You can also use these steps if you have a huge, well-developed network. The general idea: Do the best you can with what you have. You might have to use other methods after, like applying directly to companies, applying on LinkedIn, or job boards, that’s fine. But you should still start with whatever network you have. This step is really important. Tell everyone! If someone doesn’t know you’re job hunting, they can’t help. Your network is the fastest way to get a job only if you talk to multiple people and get the word out! You never know who in your network has connections to different companies and industries, so always casually mention that you’re job hunting any time you can fit it into a conversation. If you’re close to somebody (a sibling, best friend, parent, etc. ), you can be very direct in asking for help. But, the less closely you know someone, the less direct and “aggressive” you should be. Don’t approach somebody you haven’t talked to in 2 years asking for direct help. It’s NOT a good look. Tell them you’re job searching and ask for advice, or ask a question. I’ve seen this work for cold-approaching strangers on LinkedIn too, at companies you want to work for. Now John would respond and give you his opinion. And after this, you can let the conversation continue a bit, and then ask for help finding a job or getting an interview more directly. For example, maybe John tells you the marketing group is great and would be great for a new graduate like yourself. Now you’re asking or hinting at the fact that you’d like an introduction if possible. That’s how to let it flow naturally into a conversation with someone who you messaged out of the blue, or someone you already know but aren’t close with or haven’t talked to recently. Go through your network, making sure people know you’re job hunting. And just keep repeating. If your network is small and you run out of people, use the scripts I gave you above to cold-approach people on LinkedIn. Build your network further! Will this get you hired every single time? No, I can’t promise that. But it’s where I’d start! It’s definitely the fastest way to get a job because of the 3 big reasons mentioned at the start of the article. 1. In general, don’t come right out of the gate asking for a big favor to a stranger, or an acquaintance you don’t know very well. This includes asking for an introduction right away, asking them to look at your resume/CV, or attaching your resume/CV into an email. Don’t do that! 2. Ask questions and make it a real conversation. Don’t just seem like a “taker” who only wants to use them for something. Thank them for any info/answers they give to your questions. Their time is valuable so show you appreciate it. They don’t owe you anything. Be appreciative. Same goes for an academic adviser or former university professor. They should want to help you find a job. But that’s not going to work with other people in your network. So use your best judgment. If you follow these steps above and focus on this at the beginning of your job search, you’ll boost your chances of getting a job much faster, with less effort and less hassle. Now, you might need to use other methods to find a job, too. But this is where you should start first to give yourself the best shot at getting a great job quickly.